Years ago, I was in the envious position of testing hiking boots. I walked thousands of miles using every brand and style imaginable. Low-end boots aren’t worth it. Don’t even go there. Your safety is worth good boots. The hallmarks of cheap boots are poorly glued on soles that quickly delaminate, poorly stitched uppers that start fraying and falling apart, midsoles made from cheap foam that lose their cushioning qualities and outsoles that are hard as a rock, resulting in no cushioning and poor grip. Always consider your terrain. Hiking in the desert and over the summits of the White Mountains couldn’t be more different. Your choice of boots needs to accommodate the terrain. 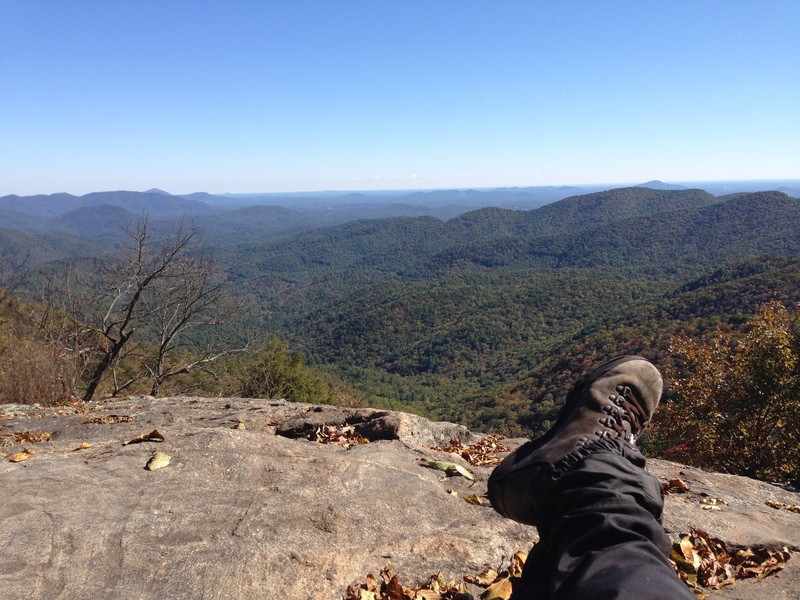 If I’m hiking in mostly rocky areas (e.g., the AT) I always wear “above the ankle” style boots. There’s little more painful than rocks and roots hitting bare ankle bones. The added protection is key. I also prefer the extra stability that high boots provide. My trail miles have included a few ankle twists and rollovers, so the higher style helps a lot. Leather or Leather/fabric? I frequently get asked this question. It’s totally personal preference. Leather/fabric are lighter and more breathable. All leather seem to provide more durability and stability over the long haul. I always go with all leather. Fit. The most important consideration is the one many people don’t research enough. Here are four critical things to remember. When you try on hiking boots, you should ALWAYS wear the socks or sock combinations you will wear on the trail. If you forgot to bring socks with you to the store, lay down some coin and buy some new ones off the rack. I always wear polypropylene liner socks and wool outer socks. I wouldn’t consider trying out a pair of boots without wearing them. Not every store carries liner socks, so I always bring them with me. Obsessive? Perhaps. But I’d rather be sure about my boot fit than be suffering from sore feet three days from the trailhead. The shoe store floor is flat as a pancake. The trail isn’t. One store I used to buy boots from had a ramp you could walk up and down to see if your foot slid forward in your boots or not. This was pure genius. Unfortunately, they got rid of the ramp. But they still have an impressive set of stairs next to the shoe department. I use them. Here’s why. If your heels move in the boots, you’ll get blisters. If your feet slide forward, you’ll bash your toes against the front of the boots on descents. Either problem is disastrous. If your heels slip, but other aspects of the fit seem fine, see if you can “lock down” your heel position by making sure your laces are snug across your arches (the position of the fourth set of speed laces from the top of the boot in the graphic shown below). Make sure you have enough room in the toe box of the boot to allow some expansion. Your feet swell during the day. If your boots start out too snug, you’ll likely suffer from foot pain as the day wears on. In store or online? For all the reasons outlined above, I almost always prefer buying my boots in a store. But there is an exception. Boot manufacturers tend to use the same molds (called “lasts”) when they build their boots. It’s really expensive to change the lasts, so, while boot styles change from year to year, the fit rarely does. What this all means is that if you find a boot that fits, you can be reasonably sure you can buy a pair made by the same manufacturer and get the same result. Breaking them in. If you take a pair of boots out of the box, put ’em on and start hiking down the trail, there’s a good chance you’ll regret it. I suggest wearing them around town, on short hikes or wherever you can provide a bit of a break-in period. The boots will conform to your feet and feel a lot better when you take them on their first long spin. Understand what you’re stepping into. They may seem like a fairly simple bit of outdoor gear, but there’s actually a lot more that goes into a pair of hiking boots than meets the eye. And although you don’t need to know every intricacy of how your boots manage to provide such great support and protection, it certainly helps to know a little about what you’re stepping into. Understanding the purpose and job of each component of your boots also helps you appreciate their value, and makes choosing and buying a new pair much easier. This is especially important when you are shopping for boots in store; your sales assistant will be using all sorts of terminology that is totally meaningless without some background knowledge. So whether you decide to snap up a new pair of boots online or in store, be sure to scrub up on your hiking boot knowledge before you start looking for the best hiking buddies you’ll ever have! Boot graphic courtesy of www.CooloftheWild.com. Looking for more hiking tips? 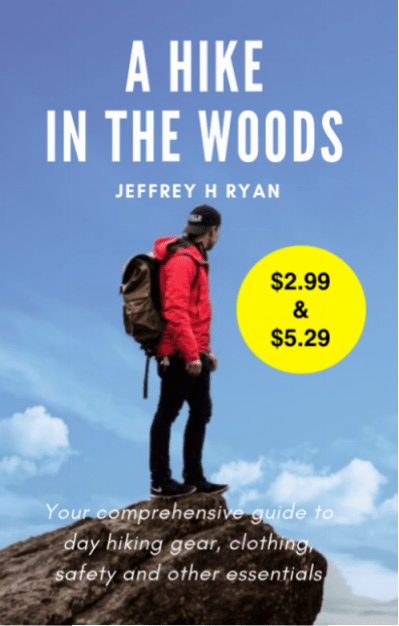 My 50-page book A Hike in the Woods: Your comprehensive guide to day hiking gear, clothing, safety, and other essentials includes the above blog post, plus chapters on first aid, gear, places to hike and more. Hi, Jeff! Great and very useful article! Having problems and feel the pain during a hike when you can do much about it can really ruin the experience, not to mention stop you from continuing. Beginner hikers can really use these tips, especially if they never wore a hiking boot before. As a backpacker, I am always worried about to purchase hiking boots. After purchase, its kill my leg. I can’t move. But after reading this article, hopefully, this time I can purchase the right one. Thanks for sharing the nice article. You’re most welcome. Glad you found it helpful. Thanks to my friends at Cool of the Wild, I was able to add a more detailed graphic of the parts of boots.